200 mm/50 3rd Year Type No. 16 х 1 pcs. 80 mm/40 3rd Year Type4 х 1 pcs. 203 mm/50 3rd Year Type mod. E3 х 2 pcs. 13 mm/76 Type93 Twin2 х 2 pcs. Furutaka — Japanese Tier V cruiser. A powerful scout cruiser employed to carry out reconnaissance operations and to protect battleship fleets from enemy light naval forces. Furutaka’s primary distinction from her predecessors was an enhanced artillery armament featuring a pyramid arrangement of turret mounts. 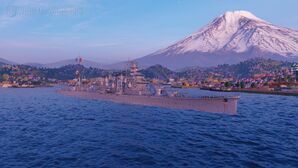 The first heavy cruiser within Japan's cruiser tree and one of the first heavy cruisers in the game, Furutaka carries a powerful complement of six 203mm guns, allowing her to deal with anything she encounters. While slow-firing, their large caliber and accuracy allows Furutaka captains to deal large amounts of damage in a single salvo. Fully upgraded, her guns have a range of 13.9km, while her torpedoes can hit 10km. A common tactic is to close in on an isolated target and launch all available torpedoes before turning around to disengage. While she is faster than most cruisers at her tier, she rapidly slows down when turning, as such you will be the most vulnerable when turning to run away from the opponent. If possible, captain's are recommended to remain undetected, as Furutaka's poor armor prevents her from tanking damage effectively. Avoid getting drawn into a close range gunfight at all costs, as Furutaka will almost always lose. The ship excels most when firing at unsuspecting targets from a distance. Despite her poor armor, playing Furutaka plays more like a strike cruiser rather than a typical heavy cruiser. Often the best way to play the cruiser, especially in higher tier battles, is to find a battleship or destroyer to support. Furutaka's weak armor can be compensated for by conducting evasive maneuvers and angling. While her hull can withstand armor piercing shells from other cruisers when angled, most battleships will have little to no problem over-matching most sections of the ship. Furutaka's Hull C upgrade has changed quite drastically to reflect its historical renovation. Aside from increasing the AA suite's armament, the upgrade now rearranges the cruiser's six guns into three dual-gun turrets, two superfiring turrets on the front and one on the rear, the same configuration that Aoba carries. This basically doubles Furutaka's forward armament compared to its Hull B, allowing it to chase and track targets far more effectively with its forward guns, and carry out evasive maneuvers while firing. Faster than most other cruisers at her tier. Powerful, accurate guns for her tier with very large firing arcs on all turrets. HE shells have a high fire chance and great damage. Upon upgrade to Hull C, the ship can bear the majority of her firepower forwards, allowing the cruiser to pursue and harass fleeing ships with relative ease. Potent torpedoes with good range, decent speed, and powerful warheads. Torpedo mounts have excellent firing angles compared to higher tier Japanese cruisers. Lightly armored for a heavy cruiser with a large citadel. Due to her larger gun caliber, the ship has a longer reload time than most other cruisers at her tier. Short main battery firing range at 13.9km. Carries only four torpedoes per side. The ship’s anti-aircraft armament is weak and leaves the ship vulnerable to carrier strikes. Captains should first research the second main battery module for the reduction in reload time it provides. The upgraded Gun Fire Control System should be researched next to increase the ship’s maximum range. Next, captains should research the hull upgrades to gain access to the upgraded torpedoes and dual mount turrets carried on the ship’s C-hull. Slot 2: Damage Control System Modification 1 ( ) makes the ship more resistant to fires and flooding. The key skills for Furutaka include Expert Loader at Level 1, Expert Marksman at Level 2, Demolition Expert at Level 3, and Concealment Expert at Level 4. Captains who use the ship’s torpedoes often may find Torpedo Armament Expertise useful for reducing the reload time of the launchers. Last Stand is recommended to those who often find their engine or rudder incapacitated. Lastly, Basic Firing Training and Advanced Firing Training can be taken to improve upon the ship’s anti-aircraft armament. Furutaka does not have a purchasable permanent camouflage available to her. Instead, Type 1, 2, or 5 camouflage can be equipped for credits; Types 1 or 5 are recommended at a minimum to reduce detectability range. Furutaka captains should mount the standard flags to improve the ship's performance in battle. To improve upon the ship's armaments, India X-Ray ( ), Victor Lima ( ), and Juliet Whiskey Unaone ( ) flags are recommended to increase the fire chance and flooding chances respectively. To improve the ship’s survivability, captains should mount November Foxtrot ( ) and India Yankee ( ) flags. Sierra Mike ( ) flags are recommended to increase the ship’s already high top speed. Lastly, economic and special signal flags can be mounted to improve the ship’s economic gains per battle. Furutaka performing sea trials in 1939. Following the experimental light Cruiser Yubari, the Furutaka class adapted several of her lessons and was the first heavy Cruiser that entered service in the Imperial Japanese Navy. Despite numerous efforts to reduce the displacement of this class, they still overshot their designed displacement by almost 1000 tons, with a standard displacement of 7500 tons. With a length of 185m and a width of 16.5m, these ships were heavier and larger than any preceding Cruiser of their Navy. The original armament consisted of six 20cm/50 3rd Year Type guns in single mounts, those were supposed to deliver heavy strikes in night battles before the ship would then disappear into the darkness again. However problems with the ammunition supply meant that the reload of these guns could not go faster than 30 seconds. Dual purpose armament consisted of four single mounted 8 cm/40 3rd Year Type, and two machine guns caliber 7.7mm were her close range AA armament. To increase the stability of the ship it was decided to make the Torpedo Tubes fixed into the hull, with three twin 61cm Torpedo launchers on each side of the ship. Aviation facilities originally consisted of a flying-off platform on turret 4, but it was deemed as insufficient and replaced with a proper catapult during the later career. Her armor was 76mm thick at her main armor belt, with the deck being 35mm strong. The turrets themselves only had a 25mm strong splinter protection, in order to save weight. Their machinery allowed for 34.5 knots of speed while having an engine output of 102,000shp, and while going 14 knots they were able to sail for 6000 nautical miles. Modernizations during the career included a rework of the aviation facilities in 1930, during the next years the AA armament was reworked, which included new dual purpose guns with a caliber of 12cm. In 1936/1937, the main armament received a complete overhaul. The single mounts were all replace by three twin turrets, two quadruple Torpedo launchers on the deck replaced the fixed launchers in the hull and the engine got upgraded to modern standards as well. Wider Torpedo bulges were an attempt to increase the stability, however this was not successful. This page was last modified on 31 July 2018, at 15:59. This page has been accessed 71,611 times.